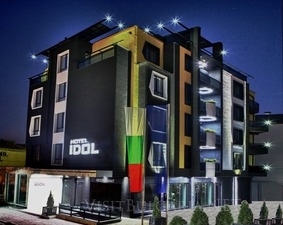 Location:Hotel "Idol" is located in the center of Targovishte - near to all administrative buildings, banks and cultural institutions. Accommodation: Hotel Idol offers 6 suites and 22 double rooms. All rooms are modernly furnished and offer free Wi-Fi Internet, air conditioner and TV with over of 60 channels. Conference centre:Idol hotel offers a conference hall for 80 guests. Wine & dine: The restaurant of the hotel adds great feeling of comfort and offers excellent cuisine, drinks and atmosphere. The guests will receive excellent customer service and special feeling.